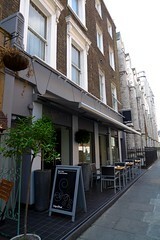 L'Autre Pied was a French restaurant in Marylebone, sister restaurant to Pied à Terre in Fitzrovia. It closed down in September 2017. French restaurant in Marylebone, sister restaurant to Pied à Terre in Fitzrovia. It received a Michelin star in 2009. Like Pied à Terre, it has a separate vegetarian menu as well as vegetarian options on the standard menu. Kake and Ewan visited on a Thursday lunchtime in July 2009. We'd booked, but possibly hadn't needed to as there were tables free throughout our visit. We decided to go for the fixed-price menu du jour (£18 for two courses, with two choices per course). Bread rolls and butter arrived as we were pondering. Oddly, the bread wasn't very good; it had the kind of tough crust that comes from too many reheatings. Tap water came in a chilled springtop bottle; top marks. Kake started with the open ravioli of spring vegetables photo. The spring vegetables turned out to be peas and broad beans; these were very good, perfectly fresh and cooked just right. The pasta was very thin and silky. It was a fairly rich dish overall, but not overly so, and the portion size was well-judged. Ewan's creamed pea and tarragon velouté was poured at the table, and featured a couple of small 'croustillon' in the middle, a rather nice, creamy but not too rich soup photo. Kake's main was roast lamb breast with pommes purees, crushed peas, and a mint-and-caper consomme photo. The lamb was tender, and full-flavoured without being overly "lamby". The consomme had a lovely tangy flavour that went very well with the lamb, a nice twist on the traditional lamb with mint sauce. Ewan's button mushroom risotto was an excellent example of the genre, with rice not too soft photo. The risotto itself was held in a metal pot alongside my plate, and the waitress ladled some onto the plate when serving it. Service was fine throughout, with wine and water topped up promptly and unobtrusively. Our final bill included an auto-added 12.5% service charge. Kake's verdict: I'd happily come back. Kat's verdict: I thought the fixed-price lunch menu was excellent value for the quality of the food. The setting isn't as intimate as Pied a Terre, but it's definitely easier on the wallet. Accessibility: One step up to get in. The toilets are down a rather precarious spiral staircase (handrails on both sides), and there's not much space in the cubicles once you've made it down there. Last visited by Kat, February 2014. Last edited 2017-09-13 15:06:37 (version 17; diff). List all versions. Page last edited 2017-09-13 15:06:37 (version 17).